A road modelling tool helped quickly identify options for additional surfacing and paving work on an alternate route after the Kaikoura earthquake wiped out the town’s main road link. Two minutes after midnight on Monday November 14 last year, the second biggest earthquake in New Zealand’s history struck south-west of Kaikoura. 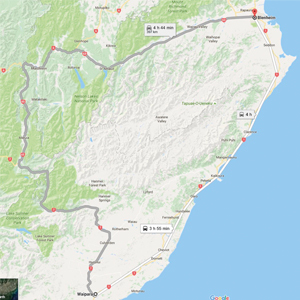 The quake devastated the main transport arterial route through Kaikoura which links Picton and Christchurch, cutting off the small town and severely impacting the main freight transportation network in the region. The New Zealand Transport Agency’s immediate requirement was to analyse and advise on a safe, alternate transport route as quickly as possible. Gordon Hart, from the NZTA and director at IDS (Infrastructure Decision Support – an industry-driven not-for-profit organisation), and his team were tasked with this challenge. They were given a two-day turnaround to assess what their options were for an alternate route for primarily freight vehicles, which at that stage was the State Highway 63 to State Highway 7 network. They needed to know what additional surfacing and paving work might be needed on this alternative route in order to create a sustainable route for the medium term, with a time horizon, at that time for planning purposes, of up to three years. In terms of the impact on the alternate route, it was going to be a massive seven-fold increase in pavement loading. Reconnaissance work was needed to firstly assess if it was actually a viable route. A reconnaissance team was quickly assembled. Based on their knowledge of the network and on what they could see of the route’s current performance, they realised they needed to take a more multi-layered approach and utilise all the tools available to them. The dTIMS (Deighton Total Infrastructure Management System) modelling tool is accessible to every road controlling authority in New Zealand, regardless of its size or resources. For more information contact IDS: http://ids.org.nz/. They engaged IDS’ industry modelling tool dTIMS (Deighton Total Infrastructure Management System). Robust modelling work had recently been carried out on the national network generating a 20-year forecast, and this was used as a starting framework to assess the new route. A key part of the project fell on Elke Beca from Opus, who carried out the modelling / theoretical work over two working days and one weekend. The team found the dTIMS tool was flexible enough for them to customise and add in extra functions, specifically the expected traffic loading increases. This increased the sensitivity of the model, resulting in a model-generated work programme that aligned very well with the programme visually assessed by the team in the field based on people’s knowledge of the network. This gave the whole team confidence they were in the right ball park. The reconnaissance work was carried out on the Thursday / Friday, whilst simultaneously, Elke was conducting the dTIMS modelling work. They drew on both the modelling tool and the team’s experience to help construct a plan of what additional programming and surfacing work was needed to create a sustainable route for the medium term. By the Monday morning the team had a good first cut. It gave them a programme of immediate needs that were visually obvious or already planned, along with the less obvious, where current condition was satisfactory but forecast to deteriorate rapidly due to expected increases in traffic loading. The project team then went back and, this time, looked at the theoretical structure of the network to determine if there were any more requirements they might need to cater for in that two- to three-year planning period. “We needed to worry about the theoretical capacity of the pavement because it obviously had not been built to handle such a high traffic load,” says Gordon. “The problem was all of that work still relied, to an extent, on using a current performance level indicator of the network to assess its future requirements. We needed to extend a little beyond that from what we would normally undertake in a modelling analysis, and look a little more closely at conditional trend information, particularly the trends relating to pavement strength capability. The biggest challenge was the fact that the network was live. Having got through the first cut of determining what the immediate needs were via the modelling work, the team then had to build that live, which Gordon says was a mission in itself. “When the reconnaissance exercise was done in the field there wasn’t any freight going across Cook Strait,” he says. “However, by the last day of the two-day reconnaissance exercise, there were trucks being dropped off at Picton by the ferry and they were travelling down the route. We finished the reconnaissance exercise while the route was very, very busy and with a high volume of traffic, a lot of which was heavy. An alternate route was established for the main freight transport network (highlighted in grey). All those tools put together gave the project team the best chance of being able to construct a programme that they could put in place while the network was live, and minimise any further disruption to traffic resulting from the pavements and surfacing inability to perform. Gordon says, “It was pretty much a case of using all the tools that we had and the dTIMS modelling tool was very much a part of that. For the project team, the immediate driver was to start getting on with it because the network is working and traffic is on it. Gordon admits, “It’s always nice to have a lot of time to plan but the reality is we were dealing with a live situation and that is one of the reasons it was essential to recognise that we had the tools to be that responsive. “To be able to theorise the capacity of the network, we needed to go out and do some testing and get a little bit more information about the pavement itself and that takes time.